This is first show of the 2013 Australia/New Zealand tour - and the venue is Perth Arena. Perth Arena is a new entertainment/sporting venue, officially opened just a year ago (November 2012). It is located in the city centre of Perth, Western Australia. It has a unique design - based on the Eternity puzzle - and has a retractable roof. Capacity for concerts is 15,500. Critically acclaimed music legend Leonard Cohen is returning to Australia for a series of enigmatic performances starting at Perth Arena on Wednesday November 13, 2013. An artist who requires no introduction, Cohen is arguably the greatest singer songwriter of modern times. His foundations as a poet can be seen throughout his colourful and emotive song writing. Cohen has created an anthology of songs that indulge the senses and stay with you long after the music finishes. At his induction into the American Rock And Roll Hall Of Fame, he was recognised by Lou Reed as “without question one of the most important and influential songwriters of our time, a figure whose body of work achieves greater mystery and depth as time goes on”. Don’t miss the magnetic and inimitable Leonard Cohen as he returns with his emotive, poignant and legendary concert on Wednesday. The 15,500 mentioned is the maximum capacity. An all seated arrangement will be significantly less though, most likely under 10,000. In any case, here are a few photos from the concert (via twitter). Last edited by zwirnie on Wed Nov 13, 2013 6:51 pm, edited 1 time in total. Thanks zwirnie. Eagerly awaiting the first concert reports and setlist from those who are there. LC&LC reports on Facebook that there were no new songs in the first set but Anthem WAS played which is great news! @jobsta Well I'm going to attempt to go to Leonard Cohen tonight. If I feel too ill and have to leave early so be it, better than not going at all! 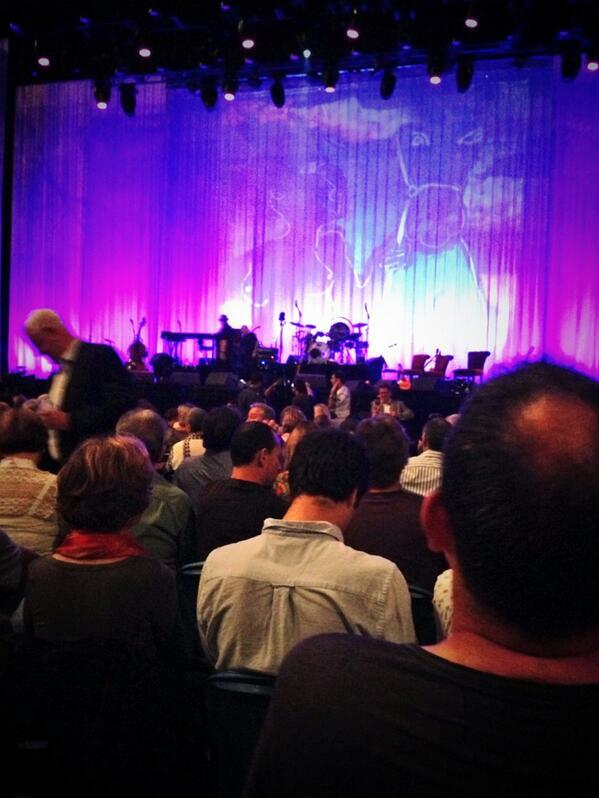 @campbellwhyte - Leonard Cohen, the whitest, most baby boomerish concert experience one can have. @JamesMcHale - Two trips to @PerthArena inside a week. Suffice to say, fair contrast between the crowd for Beyoncé and the Leonard Cohen crew. @OsheaGreen -There's an actual inverval! Leonard Cohen is amazing; pure craft & experience carrying the day. @simonjclark - First act thoughts - Leonard Cohen is surprisingly spry and nimble. Skipping of stage. Sublime first act. @AngieRaphael - Surprisingly impressed by Leonard Cohen tonight. He performed for three hours. Not bad for a 79-year-old man! @GregWRoss - The Leonard Cohen concert is sublime, almost ethereal, the violin playing a stronger role , beautiful, Lenny at the top of his game at 80! 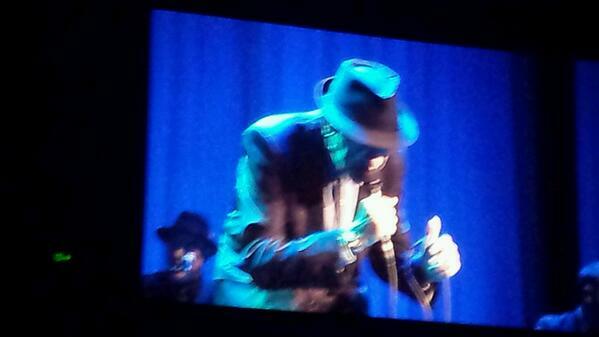 @bethlanc - Leonard Cohen was sublime. Last edited by sturgess66 on Thu Nov 14, 2013 1:51 am, edited 9 times in total. Good Lord Greg, that was quick!! Great photos and look forward to reading your concert report when you get a chance to write it. 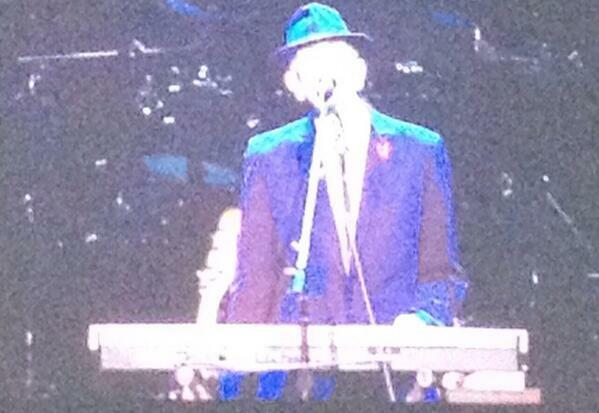 The moment Leonard Cohen walked on stage, the crowd rose to their feet in appreciation before he even uttered a word. Such is the respect for the 79-year-old Canadian singer-songwriter, who began his Australian tour at Perth Arena on Wednesday night. You may not even realise you are a fan of Cohen, but you probably are. His extensive catalogue of songs has been covered by many musicians over the past six decades. "I don't know when we'll meet again," he told the crowd early in the show. "We'll give you everything we've got." Hits performed during the show included Hallelujah, I'm Your Man, Anthem, Bird On The Wire, Suzanne, So Long Marianne, and Dance Me To the End of Love. Cohen and his nine-piece band - featuring Sharon Robinson, the Webb Sisters and musical director Roscoe Beck - performed for three hours, with an intermission to break up the two sets. "Thanks for not going home," he quipped after the interval. At times, it felt like a poetry reading as Cohen recited lines with his famous raspy voice. Other times, Cohen allowed his band to shine with solo moments, which drew loud cheers from the crowd. Cohen is undoubtedly one the greatest modern singer-songwriters with poetry that captivates an audience. In a world today where pop stars top music charts with grammatically-incorrect tunes, it is a delight to relish in some profound songs with real meaning. That is the fundamental promise from a Cohen song and he received several standing ovations during the show, which included two encores. "We thank you for your hospitality and your kind attention to our music," he told the crowd. It seemed the audience was equally as grateful to Cohen for his endurance. Leonard Cohen kept the crown at Perth Arena on its feet. With a welcoming ovation for his reputation alone, Leonard Cohen was met with incredibly high expectations as he jogged on to stage to start his 2013 Australian tour in Perth. The legendary singer-songwriter wasted no time in living up to them as he told the audience from the outset that he didn't know when he would see them again but promised "we'll give you everything we've got". It was a personal guarantee that never once wavered. First capturing the audience with Dance Me To The End Of Love, Cohen had the thousands of seated "friends" enthralled for more than three hours. Sitting tracks from latest album Old Ideas alongside songs he has been performing for decades, every line old or new was masterfully delivered from a poet revered for his craft. Most noticeably with the seemingly timeless verses of Everybody Knows - met with cheers from the crowd as it resonates just as much now as it did years ago. The suit-wearing icon expertly delved into the shadows of his past as much as he danced around the shadows from the spotlight. Known for his emotive song writing, Cohen's passion in I'm Your Man and Chelsea Hotel #2 were also as strong as they have ever been, singing these and every other song as if he had just written them especially for the night instead of performing them countless times over the years. Not shying away from his senior status, the 79-year-old icon brought out the laughs from his audience after a brief interval, asking if the cheers for his keyboard playing were merely humouring him. A master of the spoken word, he was joined by a host of musicians from around the world, with each of them earning their place on stage through incredible solo performances as well as enhancing the singer's own style. Cohen promised they would give it their all and that's exactly what he and the band did. The vocals of lyrical partner Sharon Robinson and the Webb sisters within his nine-piece band lifted songs higher that his heavy, mature vocals could reach, their harmonies almost stealing the spotlight in songs including Waiting For The Miracle. Not to mention bringing the audience to their feet in applause for Cohen's iconic Hallelujah and First We Take Manhattan. By the time Cohen ended the night everybody was already used to repeatedly standing up in applause as he left the stage, only to return to their attentive silence as he skipped back on a few minutes later. It was only after Closing Time that he was finally able to let the Perth Arena crowd go home, giving them a night of incredible music and a heartfelt performance that will no doubt remain long after this tour has ended. 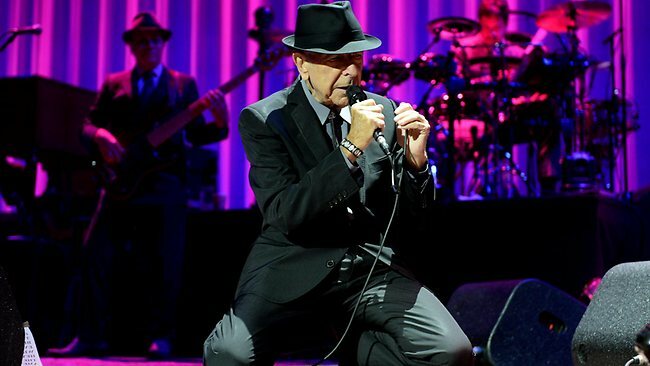 The next stop on the Leonard Cohen 2013 tour is Sydney Entertainment Centre on Saturday, November 16. LOOKING ridiculously healthy for a man in his 80th year, Leonard Cohen kicked off his most extensive Australian tour yet with a standing ovation from much of the 12,000 or so strong crowd at Perth Arena. After the opening song, Dance Me To The End Of Love, he announced in his rumbling baritone, "Don't know when we'll meet again, but tonight I promise we'll give you everything we've got." Before his 26-song and more than 150-minute set had concluded Cohen and his nine-piece band had done so and had earned three more standing ovations. To say the man was enjoying himself looked to be something of an understatement. His entrances and exits were marked by his skipping to and from the wings, the joy with which he delivered his material matching this boyish energy. The setlist included material from his debut album Songs Of Leonard Cohen through to 2012's Old Ideas, and all points between. He acknowledged his history, his classic era if you will, by offering most of his biggest "hits" but did not linger there. He has grown into his deep voice and if not quite a thing of beauty it continues to be a thing of wonder. There may be a limited range but his ability to draw out every emotion required has grown through the years. He played up the humour in Tower Of Song and drew breath-stealing intensity on The Partisan, with every word clearly ringing out as it settled on the ear, the heart, the mind. Cohen's determination that this not be just a skip down memory lane meant he was prepared to mess with the classics. In Bird On A Wire Cohen found a way to deliver his message in a way he could not manage 40 years ago, when the song was first recorded. Hallelujah and So Long, Marianne did not fare so well. He strained in delivering both as he messed with two of his most beautiful melodies. He was able to do so without great consequence because of his well-drilled band, which emphasised the majesty in what was written. Chelsea Hotel #2 featured Cohen on acoustic guitar and just a touch of B3 organ from Neil Larsen and he recounted his meeting with Janis Joplin as if it were the first time. Similarly fresh were Suzanne and Famous Blue Raincoat but on a brilliant night the single best moment may have belonged to Cohen's longtime collaborator Sharon Robinson and her reading of Alexandra Leaving. Cohen stood in the shadows and watched her take the spotlight, smiling as much as he did at any other point of the evening. Leonard Cohen plays Sydney Entertainment Centre, tomorrow; Rod Laver Arena, Melbourne, November 20; Bimbadgen Winery, Hunter Valley, November 23; Cairns Convention Centre, November 26; Townsville Entertainment Centre, November 28; Brisbane Entertainment Centre, November 30; Sydney Opera House, December 2; WIN Entertainment Centre, Wollongong, December 4; The Hill Winery, Geelong, December 7; Palais Theatre, Melbourne December 9; Adelaide Entertainment Centre, December 11. I'm very happy for you guys, that you can enjoy the Concerts of LC and the UHTC live on Stage again! I'm so pleased, that we alreaydy have this opportunity this Summer! But 2013 was THE BEST YEAR with LC and the UHTC, at least for me, and I can tell exactly, why. Everything is so very cool, so relaxed, so well chosen, so well played.... and I can't even imagine, how hard it must be for an Artist, to walk on the Stages and make the Audiences feel, that it was the very first Concert. And they have changed here a little bit, there a Tune, and the result is just and simply perfect! But this year 2013 was (in this matter) very, very near to the absolute perfection (for me it was THE perfect Year, no doubt about it). And I feel so good, that you can go to look, see, hear and feel Leonard Cohen, Hattie Webb, Charley Webb, Sharon Robinson, Javier Mas, Alexandru Bubitchki, Mitch Watkins, Rafael Bernardo Gayol, Neil Larson and Roscoe Beck. In a very strange Way, I missed them so dearly, it's hard to describe. They all was a big Part in my Life; but in 2013, it was different. But I'm sure: when you was 8or will be) in the Audience, you will know, what I'm talking about. Very, very fast (to fast), the "stock" was getting smaller.. And now it is empty since the 20th of September. A real odd, sad and strange feeling for me... but I have so many good, superb Memories in my mind, and I hope, that they will stay. No DVD, no CD, no Movie, no Foto can give you the Feeling, what you are goin' trough, when you taped them... but we have the Memories. And that's why I hope, that you don't will make the mistake and hesitate to buy a ticket (I know, the prices are high, but the Concert is worth every single Cent). Enjoy it, every single Tune! 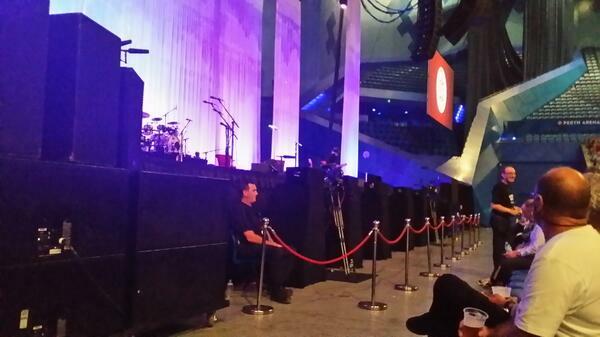 Leonard Cohen, Webb sisters, Sharon Robinson and the band were all fabulous last night at the Perth Arena. Lucky to be up so close and great to see Leonard jog onto stage for a wonderfully generous concert........just loved it. 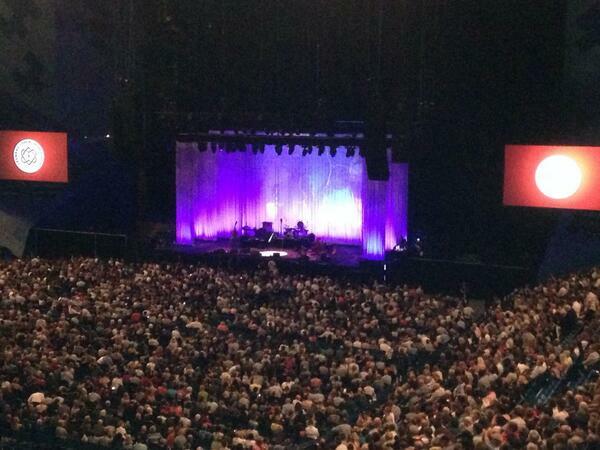 Leonard Cohen opens his Old Ideas world tour at Perth Arena. 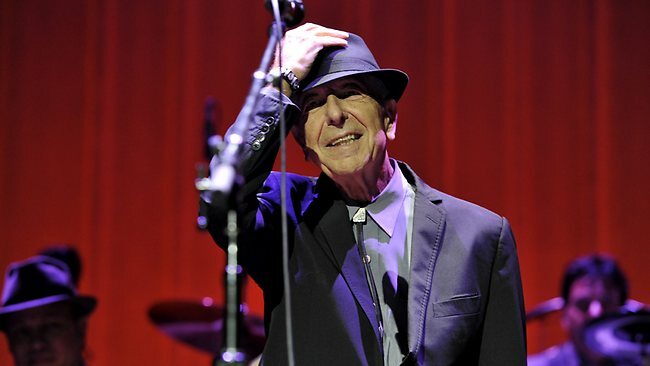 CANADIAN singer-Songwriter Leonard Cohen kicked off the Australian and New Zealand leg of his 2013 Old Ideas world tour at the Perth Arena last night in front of a near capacity crowd. After the opening tune, Dance Me to the End of Love, Cohen addressed the crowd with a promise. “Don’t know when we’ll meet again - nobody ever does,” Cohen said. From then on it was straight into the classics – Bird On The Wire, the quick tempoed Everybody Knows and Who By Fire. “Thank you,” one excited fan called out. It was then that the audience was eased into the newer songs from the 2012 release of Old Ideas, which is Cohen’s’ 12th studio album. Songs such as Amen and Come Healing seemed to be quietly accepted before the old classics continued with Lover, Lover, Lover from his 1974 album New Skin for the Old Ceremony. “We are so privileged to be here together when so much of the world is plunged into darkness.. and in recognition of them we sing this song,” Cohen said before launching into Anthem. At every opportunity during the performance Cohen took off his Fedora hat, placed it on his chest and acknowledged his international group of band members with such respect. At each solo instrumental or vocal piece the singer-songwriter would clasp his hands in awe and introduce the onstage friend. “We thank you for your kind attention to our music,” Cohen said to a standing ovation at the end of the show’s first half. Cohen opened the second half with another newer song, Show me the Place. “Thank you friends,” he said after the song. The Tower of Song was followed by the 79-year-old poet stepping up to the keyboard, much to the crowd's delight and applause. “Are you humouring me?” Cohen asked the audience. An old favourite Suzanne was followed by the witty classic Chelsea Hotel, and Waiting for the Miracle, with the duet with Hattie Webb prompting an audience member to yell out “We love you Leonard”. The ever-soulful ballad In my Secret Life was performed with Cohen’s collaborator Sharon Robinson who co-wrote the song among many others. Robinson then stepped up to perform a powerful solo with Alexander Leaving from her 2008 album Everybody Knows. I’m your Man needed no introduction and Cohen engaged with the audience in a theatrical and sometimes cheeky demeanour. The Arena floor echoed the poetry of A Thousand Kisses Deep before classics Hallelujah and Take This Waltz filled the room. Throughout the performance the harmonies between the Webb sisters, Hattie and Charley Webb, and Cohen were passionate and engaging. After the audience gave a standing ovation at the conclusion of the second half, they were taken on another ride with the first encore of So Long Marianne and new song Going Home. First We Take Manhattan created a fun experience as the crowd clapped in time and it was clear that Sharron Robinson and the Webb sisters were having a great time with it. The lights dimmed and after a few minutes of anticipation the Cohen camp emerged for a final encore to finish off the evening with the crowd favourite Famous Blue Raincoat, the Webb sisters duet of If it be Your Will and Closing Time. “Take it easy friends,” Cohen said before skipping off stage. Cohen's back in the Land Down Under and the Land of the Long White Cloud and if anything, the concert is more sublime than ever. The opening gig in Perth was a gentle affair, somehow more musically precise than before, there was a clarity of instruments and voice, giving the feel of a classical music master-class. The violin of Alex Bublitchi has been accorded more prominence, reminiscent of the soaring Raffi Hakopian violin days of Cohen's tours in the late 1970s and the music is all the better for it. At the same time Neil Larsen's Hammond B3 is more restrained, while Rafael Gayol's percussion remains peerless, so damn sympathetic it's almost a shock when a heavier rock and roll beat thunders in with the likes of “First We Take Manhattan.” Mitch Watkins on guitar at times laid down a distinctly Wes Montgomery sound, indeed jazz and blues influences are apparent throughout the concert. Then there's Javier Mas on guitar, laud and archilaud and bandurai. This man is a tour de force, every time I hear him, I am reminded of the passion and intensity of Manitas de Plata – something about the Spanish master's playing stirs very deep in the soul. It would be easy to neglect Roscoe Beck on bass, such is the finesse of his unobtrusive but essential laying down of bass patterns, only occasionally, usually in the theatre of his double bass, does Roscoe take any sort of centre stage, yet he is Cohen's long term musical director, the man who put this outstanding group of musos musos together, including the Webb Sisters on harp and guitar. Mention must be made of the boss. Cohen is playing his Canadian-made guitar with more attack than usual, his distinctive strum and pick is now accentuated with very strong individual string attacks, that resonate as musical exclamation marks to his lyrics. Speaking of voices, Sharon Robinson, muse, collaborator, co-writer, perhaps even guardian, is stunning, “Alexandra Leaving” their take on Anthony and Cleopatra, is a tour de force that takes your breath away. Cohen has never disguised the fact that female voices add spice and beauty to his sepulchral tones and he has no fear of standing back, hat off, head bowed in respect, quietly taking in velvet – voiced woman interpreting his lyrics and music. Inevitably these chanteuse are sublime gifts to the world of music – think Jennifer Warne, Perla Batalla and Robinson, a one time backing singer for Ann – Margaret. There is a moment when the Webb Sisters take ownership of “If It Be Your Will”, I first heard them perform this in 2009 and it still makes my heart stop. Some will tell you Cohen's music is monotonous, even suicidal, that he cannot sing. They are at once, both right and wrong. One thing is for sure, there will never be another quite like the Montreal Monk and surely and decently, the time to smell and write of the roses must be closing in our man. Do not miss this show, Lenny may not pass this way again. Last edited by Greg Ross on Sat Nov 16, 2013 5:45 am, edited 1 time in total.